As a small business owner it may be costly and time consuming to make a beautiful and accessible looking website especially when you don’t have anyone around that can help. But that’s no excuse to not having a digital platform where you and your customers can engage with each other. On the bright side there is something much easier and simpler to create which can help build a relationship with your customers - landing pages. Having a Lead generation technique with an effective Landing page are a power duo to a well running inbound marketing strategy. 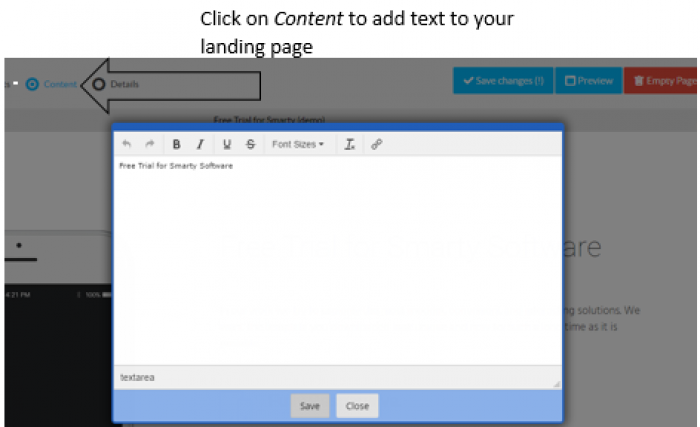 Landing pages are a gateway in capturing leads (click here for a blog post on leads) that are interested in a service that you are offering. However, often times small business owners do not know the purpose of a landing page, how to use a landing page, and how to create one. By the end of this blog post you will be educated in all three areas. Let’s get started. Note: For the purpose of this post we will only be discussing Lead Gen Landing pages which are used to capture user information. Copyblogger (2016) states that a landing page is any page on a website where traffic is sent specifically to prompt a certain action or result. If you’re still confused as to what a landing page is, this example will help. Imagine you have set up a marketing campaign for your consultancy business. New sign-ups get a discounted price off their first consultancy session. A landing page would be useful in a sense it would have a form where users need to enter their contact details such as their email address to receive this discount. The discount will most likely be sent back to their email address. From the example above, your next question is probably along the lines of “Why can’t I send the new sign ups to my website and get them to sign up there?” The reason being is your website has other ‘distractions’ going on that will defer people from signing up, these distractions could be links to your pricing, about us, etc. any other links that a user could click on instead of your intended CTA which would reduce your conversion rate. On the other hand, a landing page would have no other links on the page, simply one call-to-action button – get users to sign up to the discounted offer. 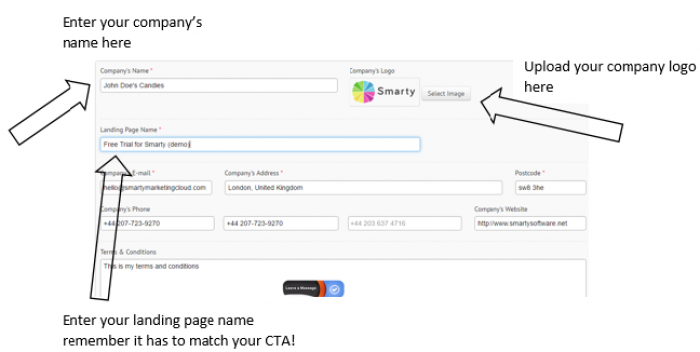 Below is a shortened screenshot of a landing page from Smarty. The landing page informs the user about promotional campaigns and how to create one. Scrolling at the bottom of the page there is a clear call-to-action to “Request a demo”. The user can now request a demo by entering their details on how to create their own promotional campaign. Although not pictured, there are no links to other there are no links to other pages on Smarty’s website. Okay now that we know what a landing page is let’s get into what a landing page should include. Keep it short. When an individual arrives on your landing page. The last thing they want to see is lines and lines of text about what you are offering. Sum up the offering in a few sentences and use bullet points where necessary. Before we get into what your headline should include. Make sure to actually use a headline! A short headline that confirms the CTA assures the user again that they have clicked on the correct CTA. Make sure when creating a landing page that your Call-to-action matches the information on the landing page. For example, imagine you have sent an email with the CTA as “Sign up to our Marketing Webinar here”. Once this is clicked users are expected to be directed to a landing page where they sign up to the webinar. If they arrive on a landing page with a headline “Sales made Easier” with images that are completely unrelated to a marketing webinar users will most likely think there is a mistake somewhere and exit the landing page. People want to see what you are offering in action. Visuals help to reinforce this. For example, if you are offering an eBook about Search Engine Optimization, create an image of an eBook with the title “Search Engine Optimization”. The image should be bold on your landing page, as if it’s something worth attaining. You want to make sure your layout is simple and easy to navigate through. In some way, your layout and content are integrated. You don’t want your landing page to be filled with so much text that users don’t know where on the page that they have to enter their details. Instead keep the page in sections to organise information. This one is going to be a long one, but trust us it’s necessary. The purpose of this entire blog post is to inform you about landing pages. 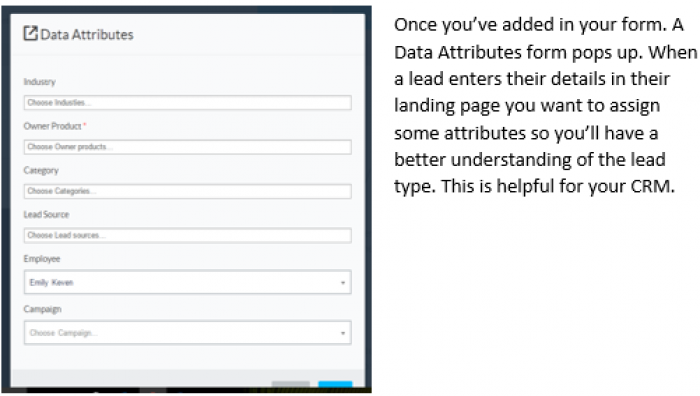 But ideally the whole purpose of a landing page is used to capture data from a user so that you can begin to offer them more relevant, and valuable content that interests them with the end goal to convert them into prospects. This is why you need an effective data capture form. What is a data capture form? A data capture form is a form that asks users to input their personal details. Depending on the details you request on the form will determine the quality of the leads you’ll obtain. Let’s put this into perspective. Imagine you run a business consultancy. 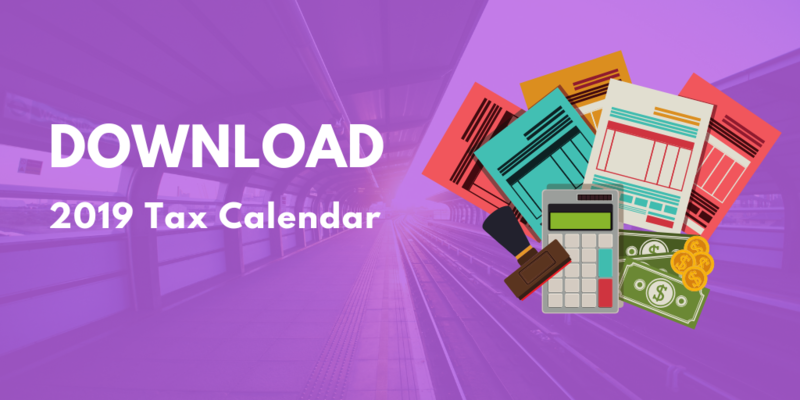 You have set up a lead generation strategy by promoting a webinar. 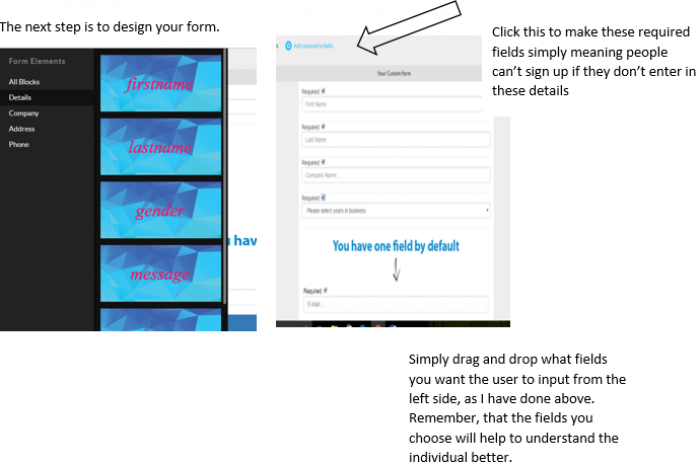 You want people to sign up to the webinar so you create a landing page with a form to fill out. On your form you have only asked for 2 things. Name, and email address. This is great and all because an email address is valuable to send more information but on the other hand you have little indication of how you can strengthen your relationship with this lead because you don’t know what specific offerings will be of their interest. If you requested the user to input more information such as their area of business, how many years they’ve been in business, are they a small business or medium sized, what is their biggest challenges – this is the type of information that will help you to understand your leads better and offer them more content in the future that will be more beneficial to them. The problem is though, that people don’t like filling out longer forms, but longer forms bring more qualified leads and shorter forms are quicker for people to fill out, but are less qualified. It’s better to find a balance when creating a form and asking for only the details you really need. Okay so now that you know all about landing pages. 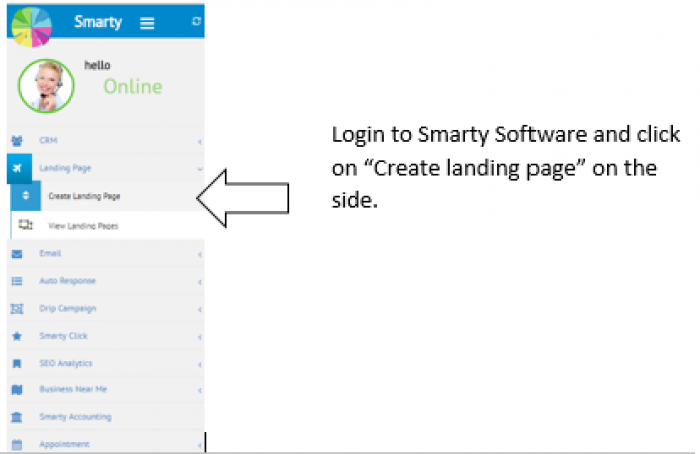 We’ll show you a quick overview on how to create landing pages using Smarty Software. Follow the screen shots to understand to gain basic understanding. We're going to spoil you even more! We have created a demo video showing you how to create your own ladning page. Check it out below. Congrats! You now know the 411 on landing pages. 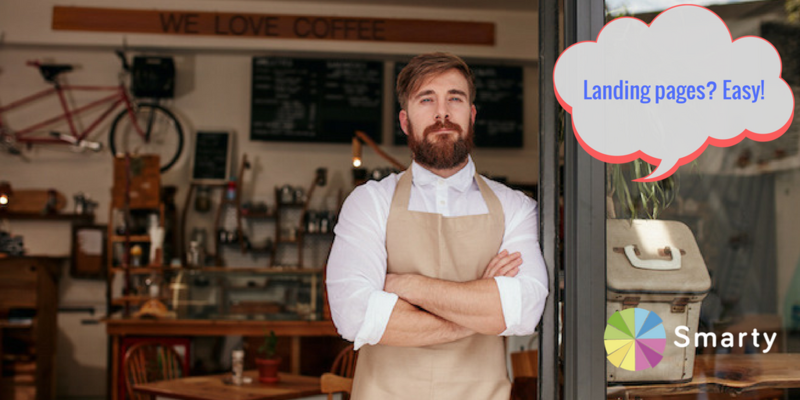 Feel free to share this marketing goodness with other small business owners.